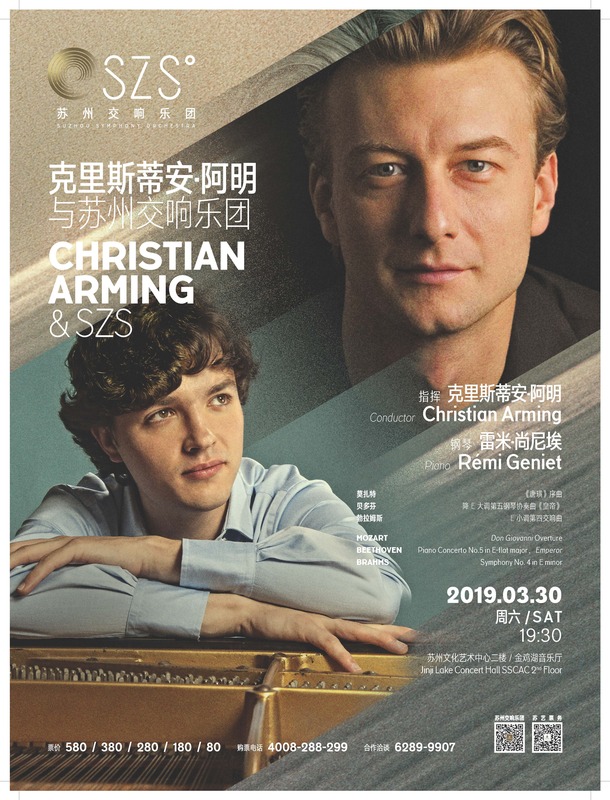 Austrian conductor Christian Arming is currently Music Director of the Orchestre Philharmonique Royal de Liège, and Principal Guest Conductor of the Hiroshima Symphony Orchestra. Previously he held positions as Music Director of the New Japan Philharmonic in Tokyo, Chief Conductor of the Janá?ek Philharmonic in Ostrava, Czech Republic, Music Director of the Lucerne Theatre and Symphony Orchestra. Christian Arming conducts regularly many of the top European orchestras including the Deutsches Sinfonieorchester, Radio Symphony Orchestra Frankfurt, Staatskapelle Weimar, Staatskapelle Dresden, Salzburg Mozarteum, Vienna Symphony, Orchestre de la Suisse Romande, Prague Symphony Orchestra, Orquesta Sinfonica de Barcelona, Orchestra Verdi Milan, Academia Nazionale di Santa Cecilia, Orchestre National de Belgique, Orchestre National du Capitole de Toulouse and Orchestra RAI Turin. In North America, he has conducted the Boston Symphony Orchestra as well as the Cincinnati, Houston, Atlanta, St. Louis, Colorado, Utah, New Jersey and Vancouver Symphony Orchestras. He is annually invited to both Aspen and Round Top Festivals in the United States. Recent highlights include performances with the Taiwan Philharmonic as well as re-invitations to the NHK Symphony, Shanghai Symphony Orchestras and National Polish Radio Orchestra, Monte Carlo Philharmonic, and Prague Radio Symphony Orchestra at the Prague Spring Festival. Equally at home in the operatic repertoire, Arming’s work has won him critical acclaim in opera theaters including the Salzburg Festival, Lucerne, Verona, Strasbourg, Cincinnati, Trieste, Frankfurt Opera, Teatro Regio in Turin, and the Hamburg State Opera. A prolific recording artist, Christian Arming’s recording of Franck’s Symphony in D minor with the Orchestre Philharmonique Royal de Liège won him the Diapason d’Or Award. Rémi Geniet has established himself as one of the most prominent pianists of his generation, having won the second prize at the 2013 Queen Elisabeth International Piano Competition at the age of twenty. He was the youngest prize-winner of the Bonn International Beethoven Competition and was awarded first prize at the prestigious Young Concert Artists International Auditions in New York in 2015. Rémi Geniet performs internationally with orchestras including the St. Petersburg Philharmonic, Orchestra Novaya Rossiya, Ural Philharmonic Orchestra, Orchestre de la Suisse Romande, Royal Flemish Philharmonic, orchestras in Luxembourg, Belgium, Warsaw and d'?le-de-France, KBS Symphony Orchestra, Hong Kong Sinfonietta, orchestras of Kansai and Hiroshima, under conductors such as Edo de Waart, Marin Alsop, Yoel Levi, among others. A frequent guest at prestigious festivals such as Verbier, the Montreal Bach Festival, Interlaken Classics Festival in Switzerland, and Les Sommets Musicaux de Gstaad, Rémi Geniet performs regularly at the Auditorium du Louvre and Salle Gaveau in Paris, Carnegie Hall’s Zankel Hall, the Munich Gasteig, NDR Hanover, and the “New Generation” series in the inaugural season of the Louis Vuitton Foundation to enormous critical acclaim. Both his debut all-Bach CD, which received a “Diapason D’OR of the Year” in 2015, and his second release of four Beethoven sonatas, also on the Mirare label, were unanimously praised by the critics.